If you’re an investor looking to play it safe, treasury bonds could be the way to go. Also called T-bonds, they come straight from the government and can be held for up to 30 years. Although they’re a lower-return way to invest, it’s a good idea not to underestimate them. They play an important role in our economy. Whether the Fed buys or sells them affects interest rates – including interest rates offered when getting a loan to buy a house. As with other types of bonds, when you buy a treasury bond, someone else borrows your money and you receive a certain amount of interest in return. With T-bonds specifically, you’re buying the bond from the government with the expectation that you’ll get interest back at the end of each six-month period. If this sounds like something you might want to get into, you’ll need at least $100 to purchase a treasury bond from a broker, banker or straight from the U.S. Treasury. If you let your T-bond reach maturity – meaning that you’ve left it alone for 30 years – you can then use the full amount you originally paid as a way to fund your retirement. Or if you sell it sooner than that, you could pay for your child to go to college. So why are federal treasury bonds so much safer than other investment options? The U.S. has a solid reputation and position in the global economy, so you’re pretty much guaranteed to get your interest and your money back at face value. The same goes for the other treasury securities you might have heard of (treasury notes, bills and treasury inflation-protected securities) that are used by the government as tools to manage the country’s debt. 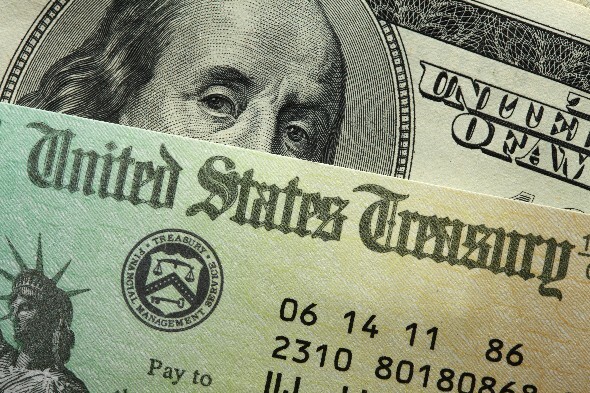 When it comes to T-bonds, you only have to pay federal income taxes on your earned interest. Nope, you won’t have to pay any state or local taxes on the return. Of course, on the flip side, don’t anticipate making a ton of interest from your treasury bonds. For the most part, the lower your investment risk, the lower your return and vice versa. Related Article: What is a Mutual Fund? If you’re not getting your bond from a broker or bank, you can buy one directly from the U.S. Treasury during one of their electronic auctions. If you’re purchasing a new 30-year T-bond, you can do so at an auction in February, May, August or November. Here’s how an auction works: You set up an account through the TreasuryDirect website, which is where you can go to find specific dates for auctions. Then, you decide if you want to get involved in competitive or non-competitive bidding. In non-competitive bidding, you’re automatically given the treasury bond interest rate set at the end of the event, plus the total amount of the bond that you wanted. You can make purchases up to $5 million within a single auction. But if you’re a little more experienced and you want to take the competitive route, you determine your treasury bond yield (your interest rate) beforehand and wait to see what happens. Your main limitation is that you can only bid up to 35 percent of whatever amount is given by the other people involved. You could walk away with everything you bid for or nothing at all, and competitive bids are awarded in the end from the lowest to the highest amount. When the prices of bonds are decided during auctions, they can be: discounts (they’re less than the face value of the treasury bond) because of interest rates; premiums (meaning they cost more than the bond’s face value); or equal in amount to the bond’s face value. Your federal treasury bond will have a coupon rate, which is the yearly percentage of the bond’s face value that you will receive as interest. And with the rates of bonds, something called the yield to maturity (YTM) also comes into play. After the auction, this is the actual amount of interest an investor could expect to earn each year when keeping the bond for its full term. It’s used to compare bonds side by side. To figure out your T-bond’s YTM, you use a formula that combines the bond’s price, face value, coupon rate, years until maturity and the number of yearly interest payments (which is two for treasury bonds). So, to break it down even further, if the face value of your 30-year T-bond is $1,000 and it has a coupon rate of 3 percent, you know you’re likely going to get $30 each year for 30 years ($15 every six months). And if bidding determined that your treasury bond price is $900, your YTM would probably be about 3.54 percent each year. The higher the coupon and interest rates, the higher your treasury bond yield. If you buy a zero coupon treasury bond, you won’t be using any of your earned interest until your bond matures and you redeem it. This could be a good alternative if you’d rather pay a lot less for a bond upfront. After you buy a bond, the government borrows the dollar amount that you paid and the money is taken directly from the account you specify. Once your bond matures after 30 years, you can redeem it or continue investing by buying another bond. But if 30 years seems like a long time, you have the option of selling your United States treasury bond through a bank, broker or secondary market. Although treasury bonds tend to come with 30-year terms, you can choose bonds that mature in a shorter time frame. For example, if you decided to go for a 10-year T-bond, you’d still be getting paid interest twice a year. Your bond would mature a little bit faster, and after a decade you’d collect the face value of the bond. Besides buying a treasury bond with a shorter term, you could also invest in a treasury bond exchange-traded fund (ETF) that’s traded like a stock. This way, you could potentially earn more money at a faster rate than you would with a standard T-bond. Also, you’d be more aware of the price your bond is going for because you could use the index to monitor how your bond is performing. One problem you might have with a treasury bond ETF, though, is the fact that there is an extra fee you’ll likely have to pay for keeping it going from month to month. When it comes to long-term investments like treasury bonds, you’ve got several options that will allow you to slowly pump money into your accounts over time. Ultimately, you’ll have to pick the strategy that will work best for your financial future and your risk tolerance. Remember to factor in the effects of inflation when you consider the long-term gains from a treasury bond, and don’t forget to find the balance of stocks and bonds that’s right for you.